Hi, I need to fill a hole in my girls leg which has suddenly appeared. I have some TPE and I read that mixing it with this substance is good to fill holes with. So just need a few guide lines on how to do this. then get a needle instrument to use to inject in the hole then use a hot spoon to seal the hole. would that be right? Yes on TPE girls this can be done, it works as a filler not a glue. Get small jam jar and dissolve a small amount of tpe (inserts are good) in Xylene try to keep it like a paste thick not thin. put the lid on and it will last for weeks. I bought needles etc. but I have found a tiny set of art brushes in B&M works well paint a layer on and build it up. If your doll is made from TPE Grahame at Lovedolluk sells TPE filler it come in a syringe as it’s easy to apply for repairing holes. It comes in Tan or Natual skin tone. My girl is a TPE one so I don't think silicone products will work. I can see right through the hole, it's at the knee. So thinking xylene and needles are best. I bought a filler before but it was such a small amount that it wasn't worth the money. So any ideas where I can get this xylene stuff the cheapest besides ebay? Same as Tommo, but got it off eBay. Good advice given is to make a paste, or the hole will get bigger pretty fast if it's too thin! I haven't had to use a TPE/Xylene mix as a filler yet, but Allies elbow is starting to get a bit of a worry... I think I'm delaying the inevitable! I made myself some tpe paste and it would seem that this xylene stuff is just like paint thinner, has a very strong smell to it. 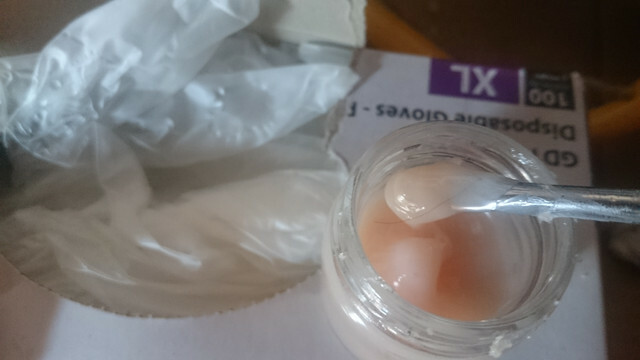 I got a small plastic bottle from pound world and poured about half with xylene then added tpe from a masturbator sleeve which was about £15. I found that the xylene was far too much and your best bet is to keep the xylene at 15% and the tpe at 85% and add the tpe in little cut off pieces. It will eventually melt into a paste and is best left 24hrs until it goes very thick , it should be gliding down the plastic bottle very slowly. If too much xylene is used then it's like acid and will very quickly make a small hole in your doll a lot bigger. I tried using a needle to inject it but it's far too thick for it to work so best to wait until a hole appears then just push it in with a small instrument and add shredded tpe inside so it will fill the hole as well. This seems to be the cheapest method as you can store it and make large quantities for another time. I always have some mixed, do it in a well vented room with proper ppe or I always stand outside and mix it on the wall, I also have a small jam jar full. I have never done an exact measurement. But you are quite right on the proportions, The paste I put in with very tiny brush. I have managed to get it into a syringe, but I made the paste just a little thinner then give it another 24hrs to thicken up inside the syringe. The jar method is the best. This batch I used for merkin backings (hence the hairs) , they stick quite well without the use of any glue. Last edited by Tommo10; 09-09-2018 at 07:38 AM.